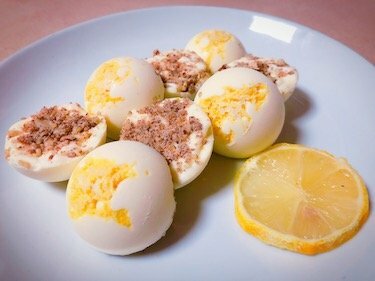 Another round of fat bombs, this time a zesty lemon cheesecake version. This one is quite pretty with the layers of lemon zest, fattened up cream cheese and pecan crust. Plus, it’s just nice to have the variety of different flavoured fat bombs. This one hits the spot when you want zesty and creamy flavours. In a small sauce pan, melt the coconut oil and butter over low heat, stirring regularly. At your stove’s lowest heat setting, whisk in the remaining ingredients (except lemon zest and juice) until fully incorporated. It takes a bit of work, but it will eventually become one consistent mixture. You may want to take it on and off the heat while you whisk to keep Remove from heat and whisk in lemon juice. Pour mixture into a pyrex measuring cup. Sprinkle lemon zest into each mould cavity then pour the cheese mixture into them. Sprinkle crushed pecans on top of each fat bomb then gently press it in with a silicon spatula. Freeze for at least 4 hours (overnight is best). Makes 15 small fat bombs (using this silicon mould).). 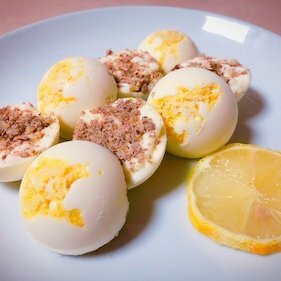 If you make these lemon cheesecake fat bombs, please let me know how it goes in the comments. Or if you share pic of your creations on Instagram, please tag me so I can see them. :).